Best remembered for introducing a car with a unique and attractive body shape to the sport, John was an exceptionally skilled driver, who could well have become one of the true greats had his ambition matched his talent. 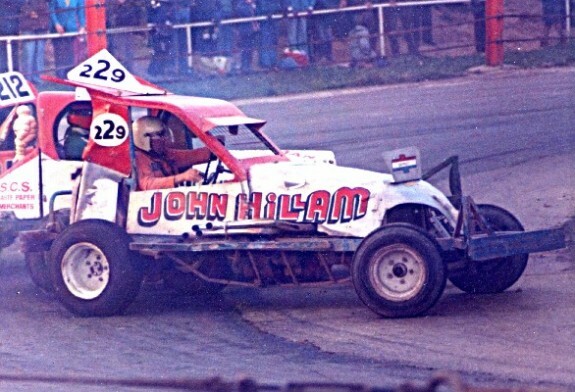 A skilled engineer, John went Stock Car racing as a means of light relief from the pressures of his Farm Machinery business. Consequently, he was in the sport for the enjoyment rather than the glory, which makes his nine consecutive top ten points finishes all the more impressive. John finally retired in 1981, his career of thirteen seasons brought to a premature end by an unfortunate shunt at Bradford. One of the sport’s most popular entertainers, John is still fondly remembered for the impact that his car design had in the 70s. Further Photographs of John Hillam can be found on Brian Watson’s excellent website Ovalaction.com – Click HERE to be taken direct to John Hillam’s page.